Published at a time when the US government's public diplomacy has been in crisis, this book provides an exhaustive account of how it used to be done. 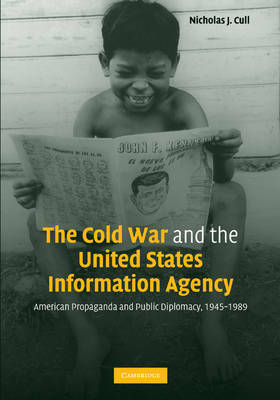 The United States Information Agency was created, in 1953, to 'tell America's story to the world' and, by engaging with the world through international information, broadcasting, culture, and exchange programs, became an essential element of American foreign policy during the Cold War. Based on newly declassified archives and more than 100 interviews with veterans of public diplomacy, from the Truman administration to the fall of the Berlin Wall, Nicholas J. Cull relates both the achievements and the endemic flaws of American public diplomacy in this period. Major topics include the process by which the Truman and Eisenhower administrations built a massive overseas propaganda operation; the struggle of the Voice of America to base its output on journalistic truth; the challenge of presenting civil rights, the Vietnam War, and Watergate to the world; and the climactic confrontation with the Soviet Union in the 1980s. This study offers remarkable and new insights into the Cold War era.